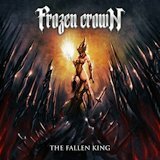 I hadn't checked out Scarlet Records' recent catalog in some time, and just happened to come upon Frozen Crown's debut, The Fallen King. As it turns out, that was a stroke of good fortune, because The Fallen King is one of the more compelling power metal albums I've heard yet this year. There are a few minor elements to criticize in the sound, but the technical work, melodies, and clean vocals are all excellent. Listeners to neoclassical guitar-driven melodies from Rhapsody or Ancient Bards will be instantly familiar with the symphonic keyboard combined with the slick guitar solo riffing. But the keyboards are mixed so smoothly in that this becomes a guitar- and drum-dominated album, showing off a sturdy, rapid-fire drum performance and some great lead noodling over all the high-speed rhythm work. But even farther to the forefront are the vocals, which consist primarily of duets, sometimes between founder Federico Mondelli and the band's primary vocalist, Giada Etro and sometimes just between overdubbed backing vocals. This isn't the first time an Italian power metal band has tried this sort of thing out, but it works beautifully on the faster songs; Kings soars to much greater heights with Mondelli backing Etro. Is it perfect? Not quite. Harsh vocals show up during some of the songs, apparently to accent them, but merely sounding out of place instead. And it turns out that while the melodies are just as pretty on the few mid-tempo and slow songs that appear on the album, Etro's singing appears to far less advantage on these songs. Offsetting that is the clear technical prowess the band has and their ability to write a snappy power metal song. Queen of Blades, coming on the heels of the quietest song of the album, emphasizes that. All in all, this is quite an impressive debut for a brand-new project.